MILAN, Italy – Leading Technologies (LT), distributor for HARMAN’s Studer in Italy, has reported significant new sales of the company’s OnAir series of consoles—and in particular the OnAir 3000. The series offers one of the widest ranges of digital on-air and production consoles on the market. Based on a modular design, the Studer OnAir 3000 is aimed at the medium to upper segment of the radio market — particularly network broadcast stations—and incorporates the familiar “Touch’n’Action” using colour GUI screens. One of the latest high profile sales has been to independent broadcaster, Radio Italia, in their new digital terrestrial studios close to Milano. This was the first private radio station to use a format dedicated only to Italian music, and it broadcasts nationwide. The station previously had a Studer OnAir 2000 and recognised that the time to upgrade was long overdue. 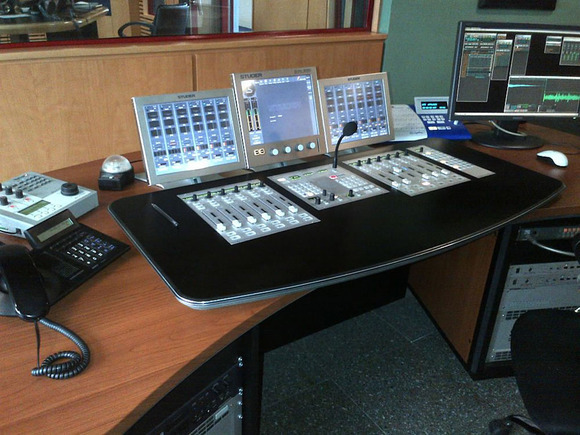 As a result, Leading Technologies provided them with an OnAir 3000 and a central SCore Live router in the main studio, along with a new OnAir 1500 in each of the four production areas, after decommissioning their former digital desks. Another multiple OnAir 3000 sale has been to Radio Maria in Erba, the largest FM church broadcaster in Europe whose origins date back to 1987. Today there are 65 Radio Maria stations broadcasting on five continents, with 19 radio in the Americas, 19 in Europe, 18 in Africa, four in Asia and one in Oceania, with more than five radios for linguistic minorities and a twinning in Lebanon. Their mandate is for Christians anywhere in the world to be able to listen to the voice of Radio Maria in their native language. The association with Leading Technologies began back in 2005. But according to sales manager, Lucio Gerelli, this time around they faced heavy competition from other vendors before the decision was made in Studer’s favour. Sensitive pricing was an important factor but the technically important issue was the simplicity of the interface which was much more intuitive than the other console they reviewed. The Studer digital architecture occupies a brand-new building housing eight studios—each equipped with a new OnAir 3000—and a large central router. Two of the OnAir 3000 consoles are 18-fader desks and the remaining six are 12-fader consoles. One important factor in the equation was system integrator, Valter Agnesani, from AVS Sistemi, as Lucio explained. “It was important to the customer to have both us and the SI based nearby as Radio Maria does not have trained engineers, but with the simple interface it has been easy for their technical manager to get into the system configuration.” Onsite training was provided by Leading Technologies’ technical manager Mauro Bucchia and Roberto Frigario, who provided an easy desk configuration. Leading Technologies have also undertaken two new installations for Group Elemedia which operates some of Italy’s largest radio stations, including Radio DJ, Radio Capital and M20, between Milano and Rome. In Rome, Leading Technologies have extended their long relationship with the organisation by providing an OnAir 3000 for each of the nine studios, with a central router and two OnAir 1500s in the production studio. According to Lucio Gerelli they had been operating on antiquated control equipment, including a 14-year-old Soundcraft SAC200 broadcast mixer. “We are upgrading one studio each month, working with their technical manager Gianpiero Mastripieri month, and in March next year they will take an entire router,” he says. Elsewhere, two further OnAir 3000s have been installed at Radio 24 in Milano along with four OnAir 1500s and a central router, while their rolling programme for national broadcaster, RAI’s regional stations has extended with a new 15-fader OnAir 3000 (12 + 3) installed in Bari—backed up by a technical course provided by LT.